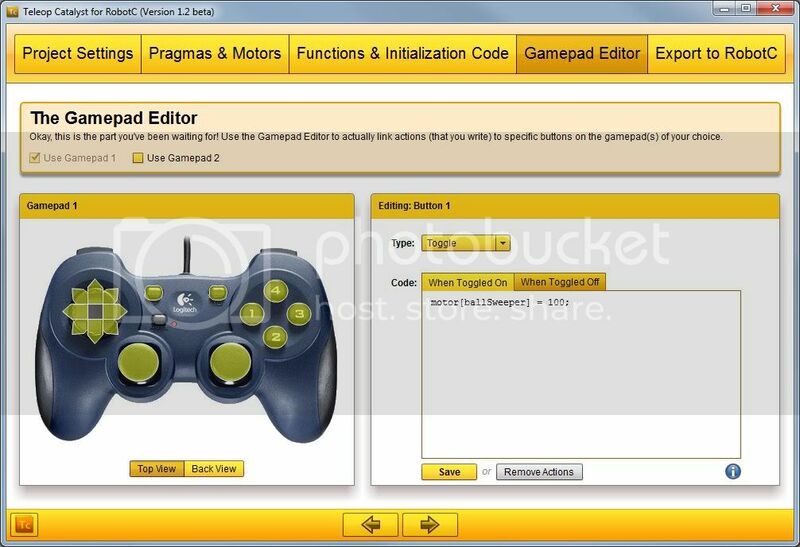 Where can I find a tutorial for programming my FTC Robot programs to my Logitech Controller? The CS2N Learn site is not helping me in that aspect. Ask for details, and you will recieve. Are the sample programs in ROBOTC not helping? Sample programs? You can set those up to controllers? I thought that was automated programming. The sample programs include autonomous and teleop programs. You can find an example of a basic joystick program in the FIRST Tech Challenge folder via the "Open Sample Program" menu item. The Joystick1.c file has a basic example of controlling motors with your joystick. Alright, automated and teleop... I'll check those out and see if they help. We'll see how much progress I make after that, hmm? Not sure if it has what you're looking for, but here's a short article on JoystickDriver.c and the various functions you can use to interact with the joystick for FTC. I actually recently wrote a program that writes the teleop code for you. I call it Teleop Catalyst for RobotC. Hmm. That's very interesting. I might take a closer look at it. By the way, those templates are helping. I generally have trouble understanding code, but a little more at the problems should answer a few of my questions.